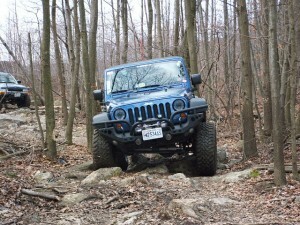 New Year Ride – Rausch Creek | Capital Off Road Enthusiasts, Inc.
January 1, 2012. 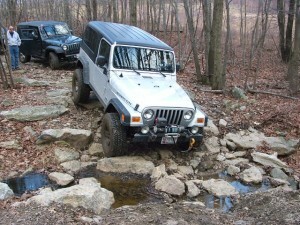 What a perfect day for CORE members to start the New Year with good friends and good wheeling. Every year CORE members get together on day 1 to solidify wheeling good fortunes for the next 12 months. This year would be no exception. In the past, CORE had chosen an easy stock friendly trail, but as luck would have it, they’re all closed now. 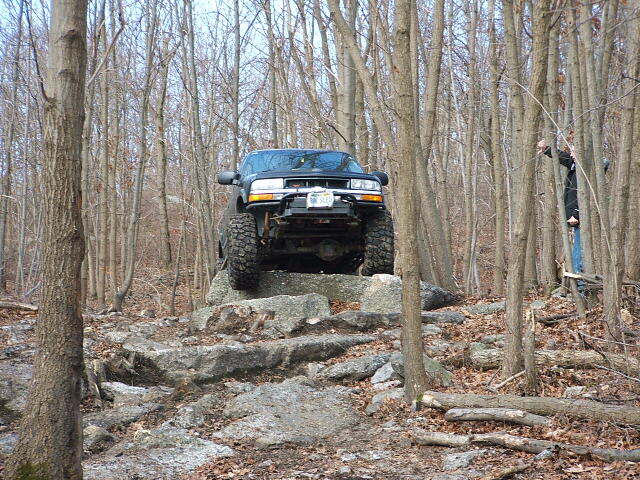 So what better way to start things off than a trip to Rausch Creek! It just added a little “pucker” factor not knowing what was on the other side. Paul, Jeff, Jay and Bob met at the Exxon. After the usual morning greetings and pleasantry’s and a quick radio check on channel 34, the group was off and running. North up 270, continuing onto RT15 and into PA was uneventful. A left just before Harrisburg and a right onto I-81 and we were almost there. As we approached exit 77, Jay, Jeff and Bob decided to continue on to exit 100 in order to pick up sandwiches at the local subway. Just as I bailed onto the truck stop exit we suffered our first casualty. A quick radio transmission from Jay stating his engine died and he was pulling over. It was only moments later the Jay announced he was back under power and continuing the trip. I pulled into the truck stop to find Larry and Berna waiting at the McDonalds and pulled up aside. Only seconds later did Paul W pull up and the 2nd group was ready to head back on the road. Paul, Larry and I met up with Jay and his crew at the Subway. Jay told us he had a weird problem with his CB, where-as when he transmitted, his engine would lose power. None of us quite knew what to make of that, but it was what it was, and back onto the road we went. We pulled up to Rausch Creek to find it full of tow rigs and trailers. There must have been at least 25 of them, but the Jeeps were no-where in sight. We wasted no time in obtaining our yearly passes and paying the daily use fee, plus a little extra for the NE property. Then back outside to air down and disconnect. There was a bit of chill in the air but it was not unbearable. It was at this point I learned that Larry’s only off-road trip, prior to this one, was to Green Ridge State Forrest. After further chatting with Larry, I promised not to take them anywhere he or his Jeep would get hurt. Then off onto the NE property we headed. For those who have not been to the new side, the trail map lists light greens (easy) and dark greens (hard). Light blues (easy blues) and dark blues (harder blues). There are also a red and black or two mixed in for good measure. (Most remarked later, that even the easy greens had telltale signs of blue in them). Down through the center of the property we went. The trail in is pitted with lots of gullies and off camber from rain run-off. I kept one eye ahead and one behind and we turned back up into the good stuff. Not being one to overlook a good opportunity, I brought the group to the first obstacle, an over the hood ledge which dropped off at least 30 degrees then down into the unknown. Over I went, dropped onto a rock ledge and continued down the trail. The drop off was smooth and looked far worse than it really was. It just added a little “pucker” factor not knowing what was on the other side. I looked in the mirror waiting for Larry to follow and noticed him perched at the top. A little coaxing over the radio and down he came! 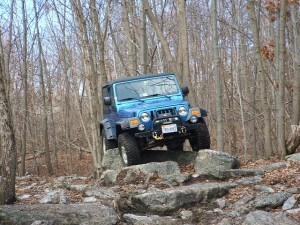 I pulled down the trail a bit to allow for plenty of room for the others to come down. I got out, looked back at Larry, and he was grinning from ear to ear. I re-assured him once again that we wouldn’t take him anywhere his Jeep couldn’t handle, and off we went. 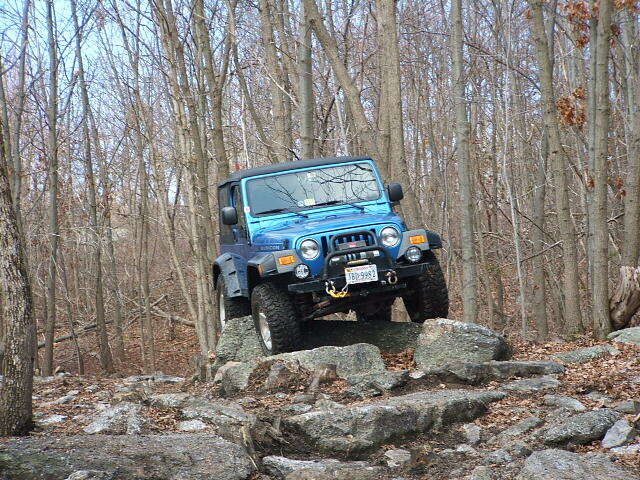 We continued exploring the new trails, went down rock ledges (where Paul W choose to show off his lift on the larger rocks), up hill climbs, across meadows and through creek beds. From time to time we stopped to spot one another and slow and easy was the ticket. It was at the end of the creek bed where we encountered two challenges. The first was a gully that dropped down 18 or so inches, to three feet across, the up two feet on the other side. Did I mention the rocks in the middle? We each navigated across it carefully, but carnage did occur. With my long wheelbase, I came down in the rear on my pintle-hitch and moved it upward about an inch. 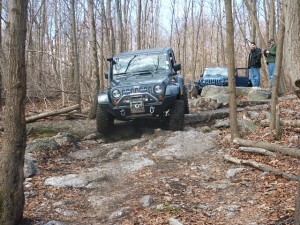 Jay in his JK came down hard on his rear bumper and raised it about two inches up into the tailgate. Well, it is off-roading and these types of things are bound to happen. Staring in front of us was an ominous hill climb. 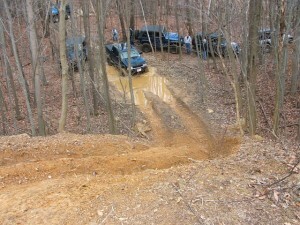 It was steep, muddy, rutted down 18 inches mid-way up and about a 30-40 foot climb. We figured this would be a good time to stop for lunch and ponder things for a bit. 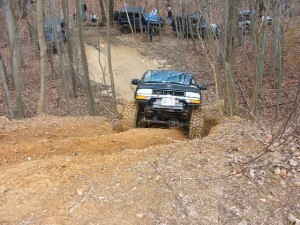 When it came time to move on, Paul W assessed the hill, climbed in his truck, set the rear locker and up he went. Next came Jay who started to slip near the top but continued over, then Jeff and Bob. All three using just their rear lockers. The top is slippery, and it does take a good amount of momentum, but as these three proved, it is doable. I led Larry around the by-pass, and met the four on the other side of the hill. Through another deep gully and off we went to explore some more. We approached a dark blue trail on the map. It extends up like a flag. When you get to the top, you turn around and head back the way you came. Sounded like a plan to me. 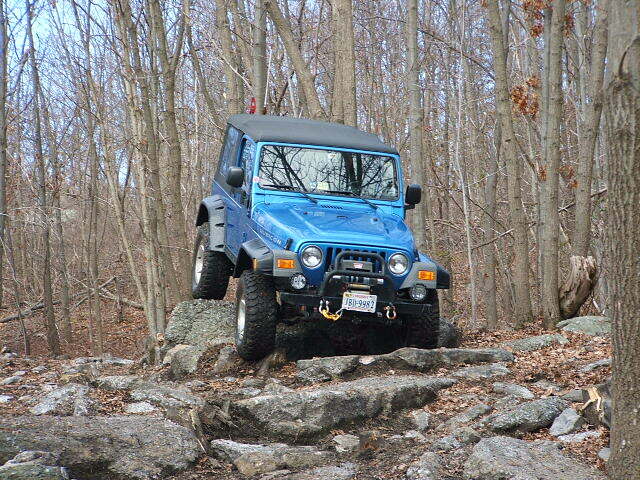 One turn up onto the trail and it was immediately evident of why it was rated a blue. 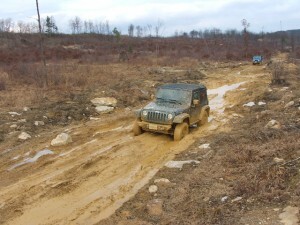 Up until now, we had remained relatively clean, this trail was ditches and sticky gooey strip mine mud, and lots of it. A steady hand and lots of momentum gets you up easy enough as does back the way down, but it doesn’t quite prepare you for the mud holes lying further along the trail. 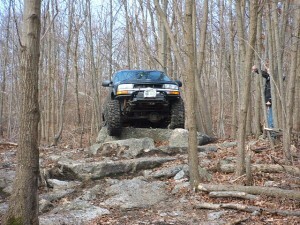 The first time I was at this section during a previous visit, we were unable to get through as the trail was blocked by a full size pick-up being winched slowly out. Now there was no-one in the way and going forward certainly seemed more fun than backing out. There are about 6 mud holes aligned in a row. They span a distance of about 200ft. 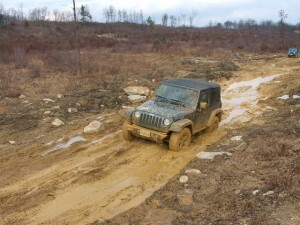 Te depth is unknown and the sides are rutted. 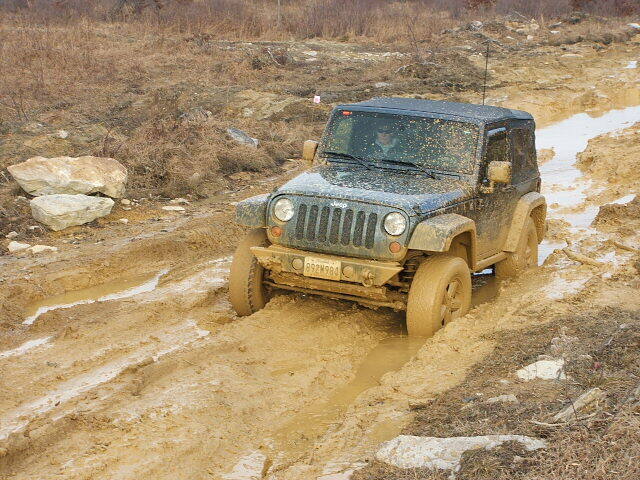 There are no by-passes till the end and the mud is thick and gooey. I have AT tires. Aww what the Hell! Off I plunged. Down in one hole and back out the other side. Mud flying everywhere and I struggled for traction and even slipped sideways from time to time. Hole after hole till I made it to the last one. Ah the by-pass…if only I could get to it…my tires were caked and played out. Locked up I eased onto the gas and slowly crawled my way onto the by-pass. I was out! By why should I be the only one to have any fun? Over the radio I called out to Jay. Jay wanted to know how deep the last hole was and I had no idea. Always being one up for a challenge, on he came. First one hole, then the next. Slipping and sliding the entire way. Down into the last hole he went, tires spinning, mud flying, then up and out the other side. Jay was out. Next came Jeff. 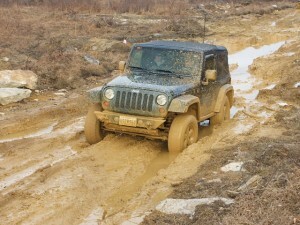 “If Jay can do it…” More mud went flying, tires searched for traction, and hole by hole Jeff came through. Paul W was up, came through the first two holes, and then decided he would take the over-land route, climbed up onto the right hand side. Larry was next. I radio’d to him (being stock on AT’s) he had two options. Come forward and take his chances (“we’ll winch you out”) or turn around and meet us back at the main trail. But Larry was having way too much fun to let a little mud spoil his trip and he was full steam ahead. Down and out, down and out he navigated hole by hole. He had a good run going, but alas, the last hole would prove to be too much. 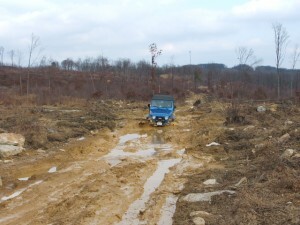 His Jeep sat passively in the middle of the hole, covered from top to bottom in thick gooey mud, tires spinning helplessly. 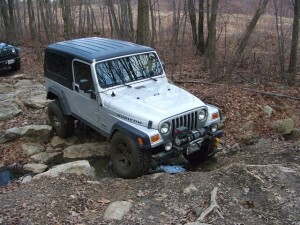 We gave him a few moments to try and find some bite, but it was no use…out came the winch. (I did tell Larry not to worry about it, it’s times like this that justifies the expense of having them). Jay worked the controls and I snapped the hook onto Larry’s D-ring on his front bumper. Good thing he upgraded from that from stock. In short order Larry was out and Bob came bouncing through. Bob didn’t seem to have quite as hard a time, now that we got rid of most of the mud for him. We all got out and stood for a minute, admiring our individual artistic work, then off for more adventure. I brought the group up a hill climb to the back side where two horseshoe shaped blue trails awaited. When we got to the top, I pointed out the signs that stated “winch required” and opened the conversation up to any takers. Jay, Jeff and Paul W were all up to the challenge. I advised them I would return to the trail exit, were there was a nasty hill climb out and would be waiting with winch in hand if needed. Bob, Larry, Berna and I all headed back to the exit to watch the action. Bob and I stood at the top of the hill and remarked that the trail was much drier than the last time we were there, watching several big rigs winch themselves up, and thought perhaps it might be a bit easier. The minutes passed with no sight of Jay. I walked down the first hill and could see Jay off to the right, about a hundred yards away being spotted over some rocks by Jeff. It was very slow going and they took the time to spot each other across carefully. Then it started to rain. Jay made is first run up the first of two hills, pot-marked with holes from those who had attempted before him and now much slicker than it had been only moments before. Then a second attempt, then a third. He just couldn’t get the momentum to get up to the top. I found a suitable tree, took the winch line by hand and up Jay came. The second hill was a bit easier and Jay was able to claw his way out. 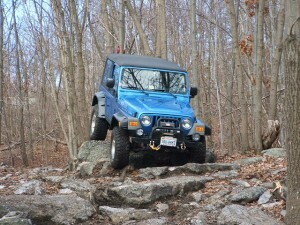 Jeff made the next run, gave it a gallant effort, unspooled his winch, and slowly pulled himself up. Paul W was next, took a good run, and just as he was cresting the top, traction gave way. Not to go down quite as easy, he gave it some more gas and up he came across the top. The second hill was his un-doing; his right tire caught the side of a tree and up the tree he climbed till we all heard a loud “pop.” Paul W had snapped a hub and was reduced to two wheel drive. Deciding we had enough for one day, we made our way off the hill and back toward the exit. We crossed into the competition area for a bit, but that’s the way the trail led us. Around we went till we found the black top road and made our way out and on to the office. If you haven’t been to Rausch lately, they now have two air compressors to inflate your tires back up, which was a nice speedy way to get back to road ready without having to drag out the portable air machines. We bid our farewells to Larry and Berna and he assured us they would be back, after a few more modifications, of course. Jay and Jeff took off next, and Bob, Paul W, Juliette and I met them back at the Subway. Paul W offered to stop for dinner, dragged out his GPS and found a suitable Cracker Barrel to dine at near Harrisburg. We stopped for dinner, discussed future trips and then called it a day. Once again, CORE members succeeded in ringing in the New Year properly! Trail report written by Paul Lepine. Pictures courtesy of Paul Lepine. 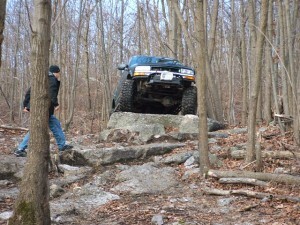 Trip Report New Year's Day, Rausch Creek Off Road Park. permalink.